Steel & Aluminum Bleachers In All Sizes! The Granite MATRA Preview continues with a preview of the bleachers Granite will be offering a sale on at the show. Granite has a well rounded line of bleachers. There are steel frame options, all aluminum options, and even portable bleacher options. Seating can range from 18 on the 9′ 3-row bleacher to 184 on the 33′ 10 row deluxe bleacher. If there is a bleacher requirement, Granite likely has a bleacher that meets it. 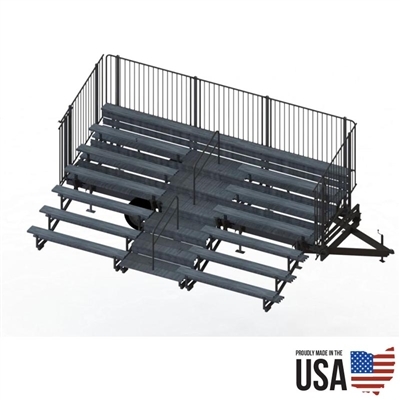 The Signature Steel Bleacher represents the most popular line of bleachers from Granite Industries. Quick setup, long life, and a excellent visual appeal come together in a value packed bleacher system. Granite uses anodized aluminum seatboards to protect the aluminum from the elements. The anodized finish also reflects the sun, keeping the seats cool even on hot summer days. The mill finish footboards provide excellent traction. The frame of the Signature Series Bleachers is built from steel. A premium powder coated black finish preserves the steel and look of the frame for years. Available in 3, 4, and 5 row setups along with lengths of 9′, 15′ and 21′. The Fold-N-Tow portable bleachers are a Granite exclusive design. Simply drive the bleachers to the location they are needed and within 15 minutes have seating for up to 107 people. Complete with a center aisle and guardrail, these bleachers look professional and provide increased safety. 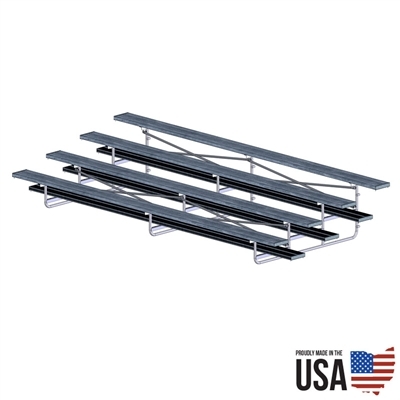 The Fold-N-Tow bleachers feature aluminum seatboards, floorboards and a steel frame. Available in 72 seat or 107 seat capacities. The SportLite all-aluminum bleachers from Granite provide exceptional value and versatility. Lightweight aluminum seatboards, footboards and frames provide a lightweight and easy to maneuver set of bleachers. Aircraft grade aluminum ensures proper strength and rigidity. Available in 3, 4 and 5 row setups along with 9′, 15′ or 21′ lengths.